Every year some boys usually from 5th and 6th class get together and play the tin whistle and other traditional Irish instruments like the accordion. They meet in Rm.12 twice a week to practice. They play their songs at the Carol Service, the Communion and the Confirmation. Most boys started learning tin whistle in fourth class as it is part of the school’s curriculum. 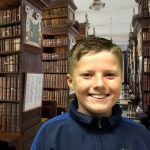 But some of the 6th class boys might have started in third class because there was an after school group that would just like the trad group get together and play the tin whistle. Mr. Grehan is the teacher that helps the boys that play tin whistle while Mr. Briody is the teacher that helps the boys who play the accordion. Last year the trad group only had five members but this year some new boys joined and there are now eight people. New members are always welcome! We wish them the best luck this year.